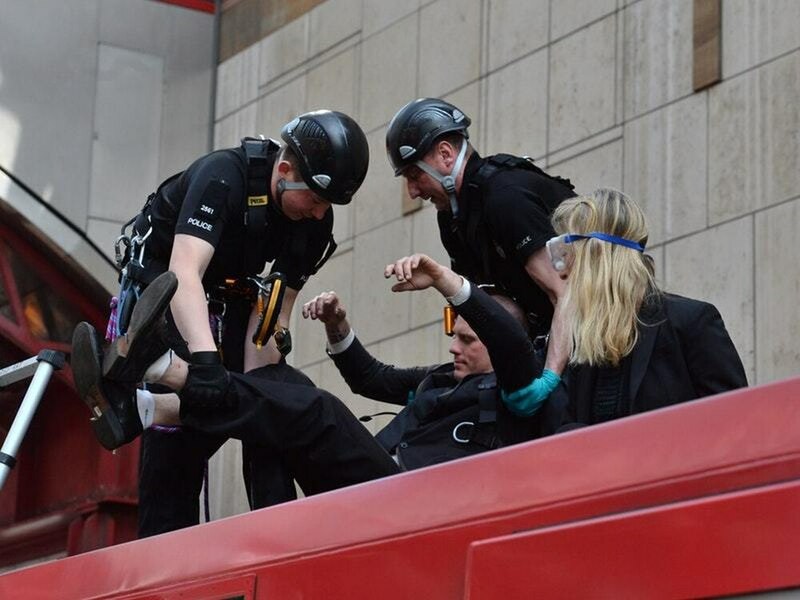 Two Extinction Rebellion (XR) demonstrators clambered aboard the carriage of a DLR train at Canary Wharf station in east London at around 11am on Wednesday. The pair, a smartly dressed man and woman, glued their hands to the roof before being removed at around 12.40pm and taken away in a police van in the busy financial district. XR demonstrations have been taking place at Parliament Square, Waterloo Bridge, Oxford Circus and Marble Arch this week – with organisers saying protests will continue for a fortnight. More than half a million people have been affected by road closures, traffic gridlock and disruption to transport and businesses since Monday. Transport for London (TfL) said the DLR stunt caused only minor delays on the network. On Wednesday, authorities disabled Wi-Fi at Tube stations in a bid to stop campaigners intent on disrupting Underground services from co-ordinating their efforts. Scotland Yard said it is now “in the process of moving demonstrators on Waterloo Bridge” and “those that do not comply may be arrested”. The group said the force made “loads of arrests” on Wednesday afternoon at its “international solidarity event” in Oxford Circus, and claims the cells in the capital are full and “operating on a one-in, one-out capacity”. But the Metropolitan Police has said it has “contingency plans in place” should they run out of space. Since its first demonstration last year, the group has injected fresh energy into the environmental cause, capturing headlines, recruits and high-profile supporters. But some critics hit out at the group’s “seriously flawed” methods. Sefan White, 24, who works for a company producing bar snacks in sustainable packaging, was stopped from getting to work on Wednesday. He said: “I’m devastated. I’m trying to get to a job now. We’ve got to go round Camden on a 30-pub journey and we’re going to be late now. Music student Anouska Stahlmann said her ill mother and elderly grandparents had to walk part of their journey because of the risk of getting stuck in a tunnel while on the Tube. It claims the systems propping up “modern consumer-focused lifestyles” will lead to mass water shortages, crop failures, sea level rises and the displacement of millions. “Only a peaceful planet-wide mobilisation of the scale of the Second World War will give us a chance to avoid the worst-case scenarios,” according to the group. The Met imposed a 24-hour condition on Waterloo Bridge on Monday evening, telling protesters to continue any demonstrations in the Marble Arch area, but on Tuesday said it extended until Friday night. Another 24-hour condition was imposed in the Oxford Circus area on Tuesday. A Scotland Yard spokesman said the force was trying to prevent “ongoing serious disruption to communities”.